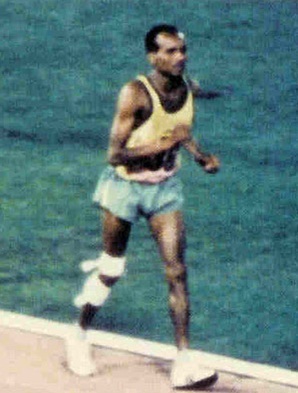 John Stephen Akhwari represented his country Tanzania to compete in the marathon in the 1968 Mexican Olympics. In the early parts of the race, Akhwari cramped up due to the high altitude of the city. At the 19 kilometer point during the 42 kilometer race, he collided with another runner and fell, badly cutting and dislocating his knee. He also hurt his shoulder when he hit the ground. However, despite the injuries, he still pressed on and finished the race as the last person of the 57 competitors who finished. Akhwari finished in 3:25:27, well over an hour behind the winner. By the time he neared the finish line, the sun had already set and most spectators had left the arena. But out of the darkness he came. Akhwari entered at the far end of the stadium, his leg bloody and bandaged. He was in obvious pain as he hobbled every step. The winner of the marathon had been declared over an hour earlier, but the lone runner pressed on. He completed his final lap to a standing ovation from the few thousand spectators who had waited for his appearance.